At the dawn of the 20th century, Percival Lowell saw canals on Mars. This network of dark bands across the martian surface must surely be signs of open water. Their geometric patterns hinting that they were built by alien life. Subsequent observations proved Lowell wrong, and it serves as a cautionary tale about making unsubstantiated claims. With that in mind, let’s look at yesterday’s NASA announcement of liquid water on Mars. 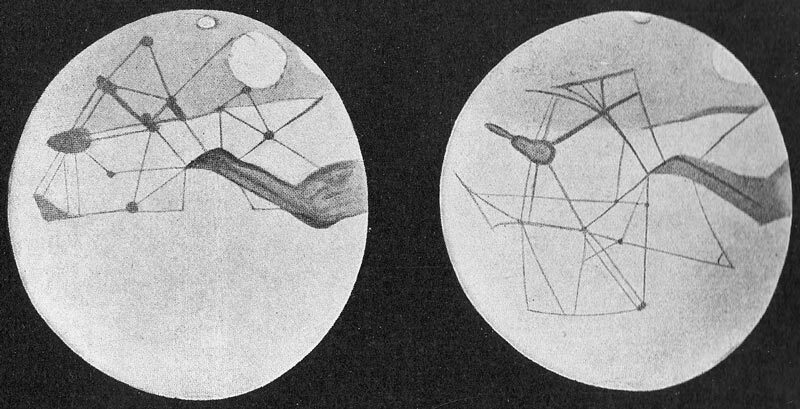 Lowell’s sketches of the martian canals. The history of our search for water on Mars is a bit convoluted, and like many discoveries in science it has happened in small steps rather than a revolutionary discovery. 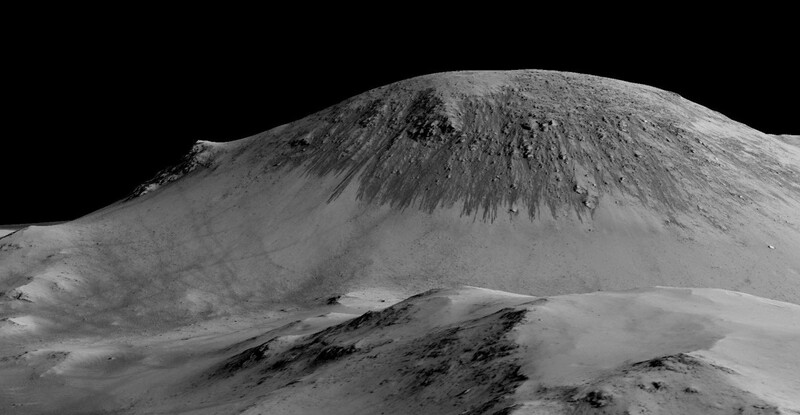 We’ve known that water exists on Mars for some time. First hinted by the discovery of martian polar caps, and then later when detailed observations of the northern ice cap confirmed that it was largely water ice. 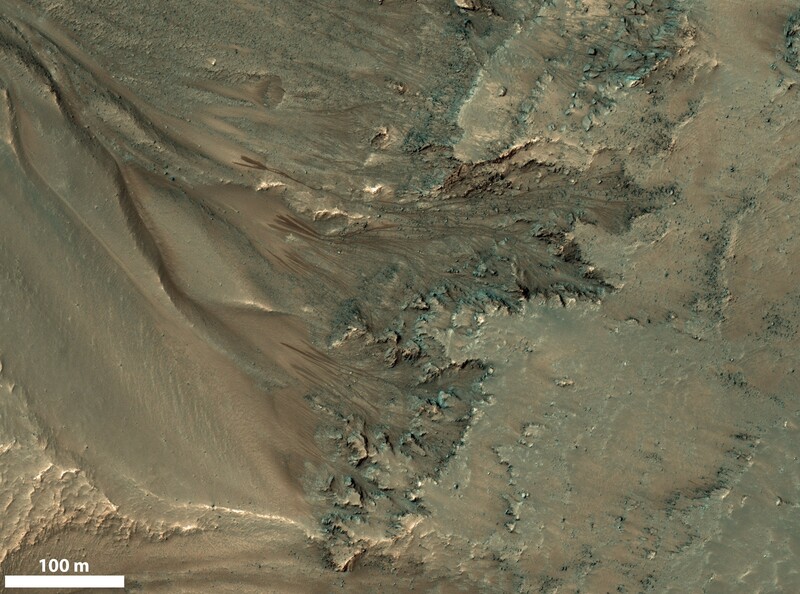 We’ve also found surface on other parts of Mars, and ice in the martian soil. 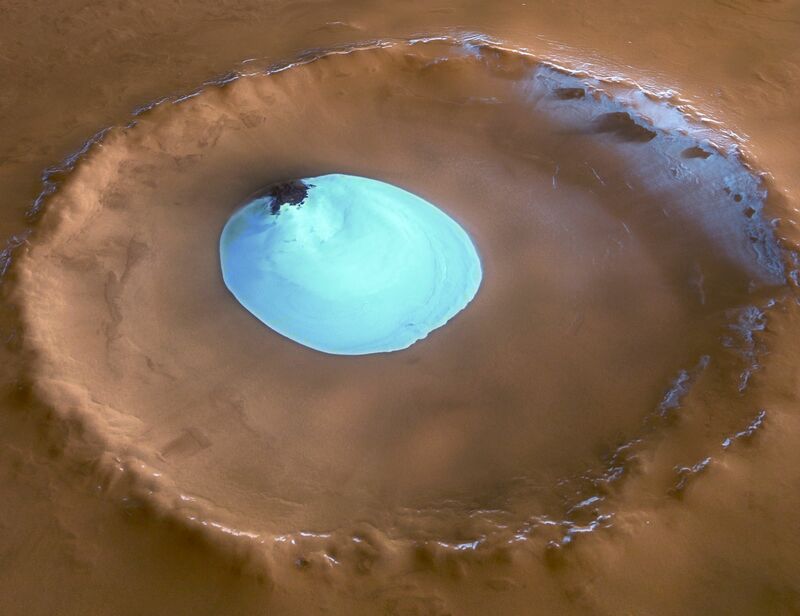 Water ice on the surface of Mars. But it’s always been frozen water or water vapor, and that has to do with the temperature and atmospheric pressure on Mars. The martian surface can vary in temperature from -80 to 10 Celsius (-110 to 50 F), and atmospheric pressure is 0.06% that of Earth at sea level. As a result, pure water ice sublimes directly to vapor, just as dry ice does on Earth. Just as our atmosphere isn’t thick enough to allow frozen carbon dioxide to melt, the atmosphere of Mars makes it impossible for liquid water to form. So we know that even a small lake of water on Mars was impossible. Mars was once a wet world, but it is now a desert planet. But there has been some hints of liquid water appearing occasionally on the surface. The most tantalizing bit of evidence has been recurring slope lineae (RSL). They look similar to what you might see if you scoop your hand in wet sand. Observations of RSL have found that they are seasonal, and are most present when the surface temperature is warmest. This screams liquid water, but we don’t want to fall into Lowell’s trap of over extrapolating. “Warm” is a relative term here, and the atmospheric pressure is still far to low for RSLs to be caused by pure water. Which brings us to yesterday’s announcement. Spectroscopic observations of RSLs from the Mars Reconnaissance Orbiter have found evidence of perchlorate salts in those regions. These are water soluble, and could create a briny water that could (temporarily) maintain a liquid state. This wouldn’t be a flow of water, but would be enough to wet the soil like a damp sponge. It’s possible that the salts would attract water moisture out of the air and dissolve to create a brine. This is the best evidence we have of liquid water on Mars. If by liquid you mean damp soil. But even that is enough to get some folks excited about the possibility of life currently existing on Mars. Damp sand and soil on Earth is filled with life, and if we want to look for life on Mars, visiting a region of RSLs would be a great place to look. But we don’t want to assume too much. The possibility of life is very different from the confirmation of life. On earth, we do have arctic salt marshes. Closest thing I can think of to those conditions on Mars. So, whatever lives there might have a chance, as long as it doesn’t need much of an atmosphere. Brine dwelling cryophiles? It’s always amazing where life pops up, just here on earth. For example, If you go to Yellowstone and look at the hot water springs, you will find orange algae that grows nowhere else.